Throughout the history of the built environment there has been no more significant endeavor than the construction of houses of worship, which were once the focal point around which civilizations and city-states developed. Constructing the Ineffable is the first book to examine this topic across continents and from the perspective of multiple faiths, including Christianity, Judaism, Islam, and Baha'i. It addresses how sacred buildings such as churches, mosques, synagogues, and memorials are viewed in the context of contemporary architecture and religious practice. 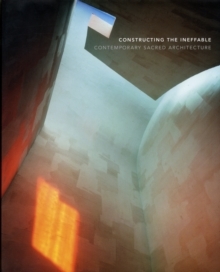 Featuring more than a dozen essays by a broad range of leading international architects, historians, and theologians, Constructing the Ineffable offers a fundamental exploration of defining and understanding contemporary sacred spaces. This thought-provoking book also invites readers to consider the powerful influence of religion on civic life and to discuss the role that design and construction play in religious buildings. Pages: 248 pages, 100 color + 200 b-w illus.